The Nashville Predators are set to face elimination tonight in Phoenix. It's the first time the Preds have been up against the wall since May 9th, 2011, a Game 6 loss to the Vancouver Canucks that eliminated Nashville in the second round. Now, 364 days later, the Phoenix Coyotes could re-enact Vancouver's role from a year ago by knocking out the once-cup favorite Predators in just the conference semifinals. After defeating the Detroit Red Wings in only five games to advance past the first round, spirits were sky-high in Smashville as their team gathered recognition as a real dark horse in the Stanley Cup race. 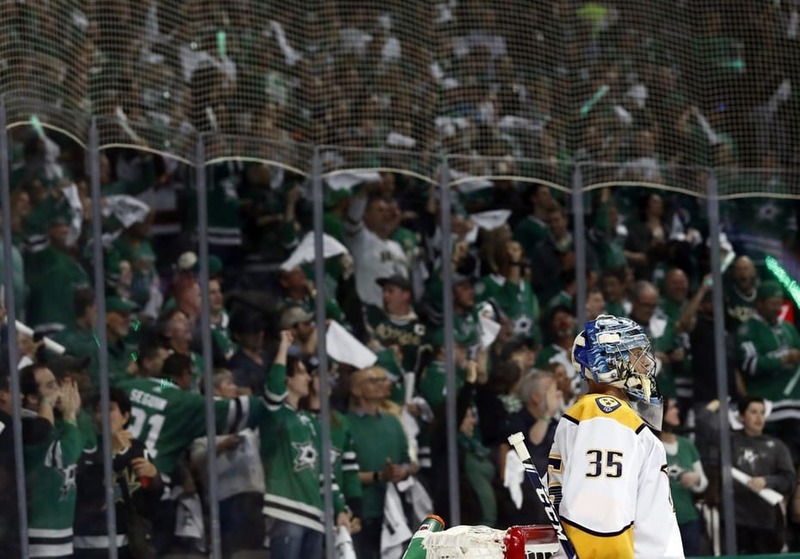 Backed by a balanced and consistent offense—something missing from Predators squads of years past—and one of the league's most reliable goaltenders in Pekka Rinne, it seemed as if Nashville was without weakness in its quest for a surprising NHL championship. But the upstart 'Yotes have since squashed almost all of that enthusiasm. The Preds' top-ranked power play—in addition to most of the rest of their offense—has been stymied by Phoenix's impressive penalty kill. The Coyotes' top-heavy offense has found a way to penetrate Rinne with ease. Jobing.com Arena has out-dueled Bridgestone Arena in a battle of home-ice advantage. Being eliminated in tonight's game (8 p.m. CT, NBC Sports Net) won't just conclude a once-promising Nashville campaign a little too early, though. It could also ruin the Preds' opportunity to field a title-contending team for years to come. After all, Nashville and GM David Poile will have one of the NHL's busiest schedules this offseason, with 16 pending restricted or unrestricted free agents, including franchise cornerstones Shea Weber and Ryan Suter. And if the Preds fail to make a deep run this May, they stand a chance of losing quite a few of them. Suter, 27, and Weber, 26—a blueline pairing that some call the most well-rounded in the NHL today—have both stated that their future in Nashville depends more on winning than on money. History has shown that contract negotiations are always all about the money, regardless of what the parties say. But in the case of the Nashville Predators vs. Ryan Suter, it truthfully isn't about the money. The Predators are willing to pay Suter market value, and he knows that...[but] the reason Suter hasn't already re-upped with the Predators is that he wants to be sure that the team is in position to compete for the Stanley Cup this season and for years to come. In similar fashion, Suter, the seventh overall pick of the 2003 draft, also told CSNPhilly.com (h/t Sporting News) that "[Poile and I have] never had a timeline or deadline [on a new contract]. We’re just focusing on winning. Everything else will take care of itself." For Suter, it's all about the cup, no matter if he wins it in Nashville or elsewhere. And Weber's mindset is hardly different. The star rearguard and Preds captain went to arbitration last summer when he and Nashville's front office failed to come to an agreement in negotiations. Although the one-year, $7.5 million contract he was awarded makes him only an RFA again this offseason, Weber has expressed obvious interest in escaping Tennesee's capital as soon as possible. The Examiner's Jim Diamond wrote after Weber's insult-laden arbitration hearing that "whether...sooner or later, Weber will probably be saying sayonara to Smashville in less than two years." In addition to Suter and Weber's individual ambitions, a plethora of questions exist over whether the Predators can really afford to re-sign both of them this offseason—with Stanley Cup rings or not. Nashville owner Tom Cigarran generally won't let the Preds payroll reach salary-cap levels, and even if he does this time around, Poile will only have about $32.1 million in space, according to CapGeek.com, to re-sign up to 16 different players. Excluding Suter and Weber, high-profile names like deadline acquisition Hal Gill, reunited brothers Sergei and Andrei Kostitsyn, hyped Russian addition Alexander Radulov and rookie standout Colin Wilson will all need new contracts come July and could each warrant upwards of $2 or $2.5 million. Depth items and up-and-coming youngsters such as Jordin Tootoo, Paul Guastad, Francis Bouillon, Anders Lindback, Jonathan Blum, Jack Hillen, Brandon Yip, Jack MacLellan and Brian McGrattan all have expiring contracts, as well. Moreover, Pekka Rinne's cap hit will jump from $3.4 million this past season to $7.0 million for each of the next four years, and AHL youngsters Austin Watson and Mattias Ekholm, among others, could soon jump onto the NHL payroll, too. With that type of secondary agenda to handle, it would be shocking if Poile was able to find the cash to deal out mega-contracts to both Suter and Weber. On the open market, Suter could probably earn a contract in the range of four years at $7 million each, and it's possible that Weber could even top that. Spend $15 million—or more—on a mere two players? It's hard not to wonder if the Preds' bank account could really support that much extra baggage. So undoubtedly, Poile and the rest of the Predators organization will have some tough choices to make this summer. They simply will not be able to keep everyone. But losing tonight's Game 5 to the Phoenix Coyotes—and being thus removed from the 2012 NHL postseason—would throw another wrench in the process. Consistent playoff team or not, the Preds' elite stars are simply tired of falling short of the Stanley Cup year after year after year in Smashville. For the Nashville Predators, elimination tonight would have much more far-reaching effects than what originally meets the eye. Mark Jones is a Bleacher Report featured columnist for the Carolina Hurricanes and the NHL. In three and a half years with the site, he has written more than 370 articles and received over 480,000 total reads. Visit his profile to read more, or follow him on Twitter.